Mike Davies, the man who only ever wears red! I once worked with a guy who was boasting about winning blanket international publicity for a new product, the first British-designed-and-built sports car for 30 years. I think his success had more to do with the quality of the story than his personal involvement. Rarely do we get the chance to work with B2B story material of such obvious appeal; the rest of the time demands seriously creativity in B2B product launches. Here’s a good example that might inspire the next launch you’re involved in. I was once asked by a large industrial company for recommendations to launch a new range of corrugated steel cladding panels, the kind you often see wrapped around factories and now many retail stores. The target audience was architects. The client wanted a big, high-profile press event and I knew my team would have to pull a rabbit out of a hat to deliver that. Here’s what happened. Seeking inspiration, I visited a retrospective of world-renowned architect Sir Richard Rogers, designer of the iconic Lloyds of London building. As I wandered around peering at the models and display panels, one thing caught my eye. It was an image of Rogers posing with business partner Mike Davies. What intrigued me was that every item of clothing Mike Davies was wearing happened to be red. I got talking to a fellow visitor and he told me Davies was renowned for only ever wearing red. That fact sparked an idea and I rushed back to the office to research it. 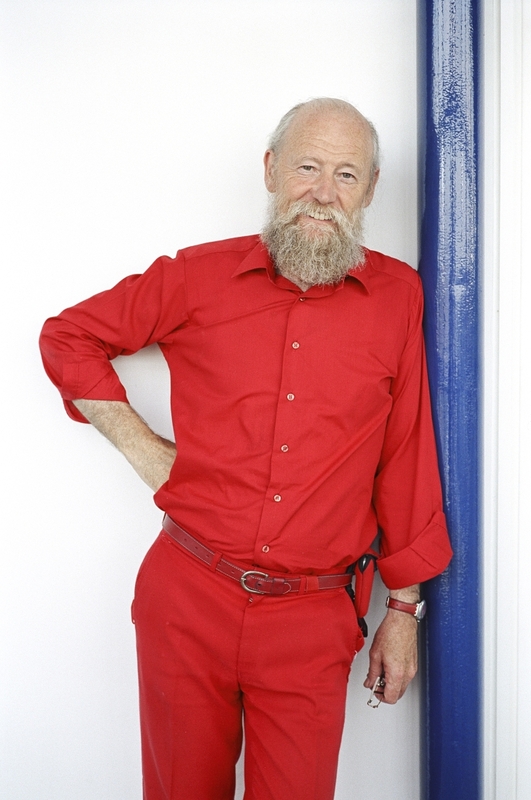 As you can see from the photo here and in a recent interview in The Independent newspaper, red is Mike Davies’ favourite colour. Among other advantages, dressing this way saves him time choosing what to wear each day. Now what’s all this got to do with painted steel cladding panels? Well that one photo started a chain of events that led to what the client described later as the most successful product launch event his company had ever seen. After I’d tested out my idea on a couple of people, I called the hugely impressive Mary Spillane, who I knew was an expert on personal image-building and invited her to present at our event. The idea was to pick ten leading architects and explain what the colour of their clothes said about them (contrary to popular myth, architects don’t always wear black). Our other guest speaker was the late Professor Tom Porter whose quirky insights made him a delight to work with. We turned the event into something much more fun and interesting, using lighting effects in the event rooms and even colour-coding the food and drinks. Colour was, of course, the link between all of this and the new product being launched. The client’s presentation, which could easily have been dry and boring, centred on how the colours for their new product range were chosen and the challenges of finding paint formulations that were technically durable, while also being visually attractive. We managed to slip in all the potentially dry but important details. The audience of architects and media loved it; all the reporters left with a great angle for talking about a potentially dull and boring product and the client enjoyed great media exposure. Not as much as the all-new British sports car, of course, but enough to remind the client he was working with a fun, creative agency that knew how to coax a rabbit out of its hat.